Got it to open, and as soon as I clicked on an industry, it crashed. There’re some files that named “RRT_***” WITHOUT “_Mud_Skippers_16” therefore this map conflicts with the others. I have uploaded a working version. When I try and tell Speck Sheep Farms to send sheep back to Perl Shores, it crashes every time. Odd, I ran sheep wool to Perl Shores the entire game and it didn’t crash. Is it possible you are using an older version of this map? The one posted here was recently updated to fix some issues. 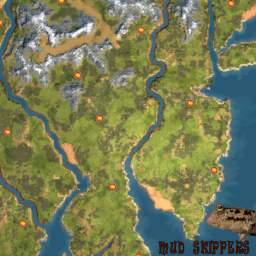 Please make sure all other files from other maps are removed from your usermaps and custom assets folders before placing Mud Skippers inside the User Maps folder. The file should run perfect as it was beta tested by twelve testers from the form. However I am sorry you are having trouble and will be checking back here often to make sure if any troubles are resolved. Great Mod well done Lowell. I had no problems loading and running it after sorting out the size issue with original SMR. I had enjoyable trouble completing stage one of the goals. But then found the other 2 stages fairly easy. I did not play an AI opponent and think that it would be very difficult (if not impossible) to complete goals if there was an opponent.